Stories, humor, and music from Blues to Flamenco with sounds you never thought could come from a harp. Well, sign up for “Blues Harp-Style” my 5-Week online course that teaches YOU to play Blues on the harp (pedal or lever) whether you’re a fledgling player or professional. We start simple so everyone can get it and then expand to whatever level YOU can do – so that everyone is playing right from the beginning – and everyone keeps playing! The Harp gets Hip in Charlotte! BLUES Harp-Style Hands-On Jumpstart Blues Workshop! Come with your harp. Leave playing the Blues! 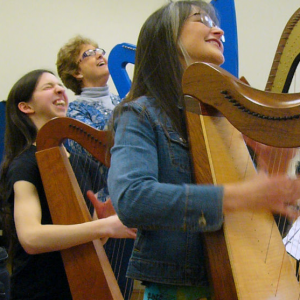 A hands-on workshop for harpists from fledgling to professional, lever or pedal harp. Potluck Lunch, Meet-n-Greet and the opportunity to sign up for Mega Lessons! 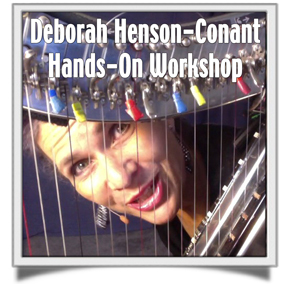 Telynau Vining Harps invites you to join an exciting weekend of harp activities on Feb. 7 & 8, including a World-first exclusive Livestream Webinar with Deborah Henson-Conant live from her studio in Boston , MA, USA! In this 4-Week course DHC takes you through the piece section by section and shows you exactly how to play all the notes and the Flamenco techniques that look and sound so amazing. The course is presented on three levels: Advanced Beginner, Intermediate and Professional for both pedal and lever harp (in Eb). The course goes through the written sheet music – and then DHC also shows you how to adapt it to make it work at YOUR personal technical level – simplifying for fledgling players and expanding to the stars for advanced players and professionals. And no matter what level you’re playing you … will … play it with FIRE by the end of the course! 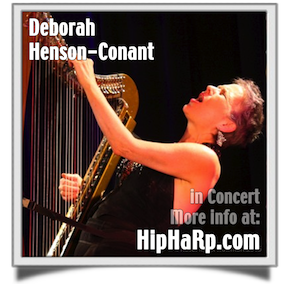 Deborah Henson-Conant is a Grammy-Nominated electric harpist with a wicked sense of humor and a theatrical flair. Circle of Friends is a throwback coffeehouse with a modern sound system, great lighting and incredible desserts 25 miles from Boston, Providence and Worcester! 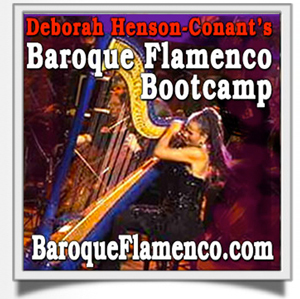 Deborah Henson-Conant brings her most popular harp workshop to the San Diego Area! Walk in with your harp. Walk out knowing how to create your own impromptu arrangements at your level of playing! Deborah Henson-Conant is returning to MoMM as part of their 15th Anniversary All- Star Concert Series! It sold out FAST last time – and now she’s back!! 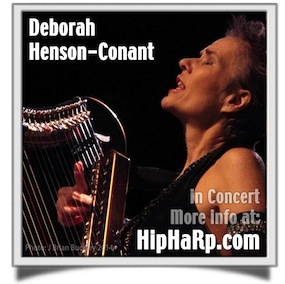 Deborah Henson-Conant is returning to the Pacific Harps Showroom for an intimate salon concert in the garden. VIP ticket holders will have an opportunity to meet and talk with DHC over hors-d’oeuvres and wine before the concert. Come with your harp. Leave playing the Blues! A hands-on all day workshop for harpists from fledgling to professional, lever or pedal harp. You’ll learn the rhythm and harmony of the Blues, the use-it-anywhere “Slap Bass” technique and how to create basslines, riffs and comping (and you’ll even learn what those words mean!). And best of all, you’ll be PLAYING the Blues! Do you want to go to the show AND the workshop? Here’s the link for the Harptabulous Package! Do you like to REALLY see what’s happening on stage? This is your chance. The Harps Etc. Showroom is an intimate space – and an incredible opportunity to see this concert up-close and personal! Do want to actually try on DHC’s harness and harp? VIP pre-show reception incudes first choice of seating, exclusive hangout AND – if you want – a chance to try on DHC’s original “DHC-Light’ harp & harness (think of the cool photo ops!) and even test out her onstage gear! LIVE Workshop at Harps Etc. Come to one of the most transformational places of my Deborah Henson-Conant’s life – Celebration Barn. This is where she first came to reinvent both herself and her instrument – in the big red barn theater created by performance coach and mime Tony Montanaro. Read more about my journey to Tony here. Check out my video about finding Tony. Deborah Henson-Conant is an electric harp virtuoso with a wicked sense of humor, a gutsy set of vocal chords and a theatrical flair! The 12th annual Cape Cod Jazz Festival takes place at the Wequassett Resort and features some of the region’s best performers. It has become one of the most anticipated events of the summer season and is free and open to the public. Performances take place on the garden terrace overlooking Pleasant Bay. Cocktails and a light menu are available throughout the evening. For more information call 800-225-7125 . 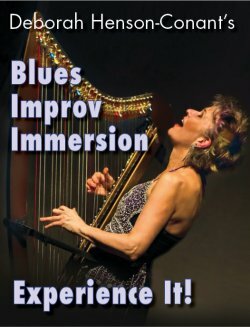 Grammy-nominated electric harpist, composer and coach, Deborah Henson-Conant, is invited to the Somerset Folk Harp Festival where she will present workshops in arrangement and performance as well as the premier of her new “Improv Immersion Experience” workshop – an ALL-day Sunday workshop add-on to the harp festival! This full-day workshop will help you take the techniques and skills that you already have right now, at this moment, and turn them into something that lets you truly express yourself … spontaneously through the use of improvisation. Grammy-nominated Deborah Henson-Conant, is invited to the Boston Harp Festival where she will present a Career Skills Workshop as well as the Closing Concert, both on Sunday! The Boston Harp Festival celebrates the harp and harpists in the Boston and New England area while featuring the harp’s wonderful potential as a solo instrument. More Info HERE. 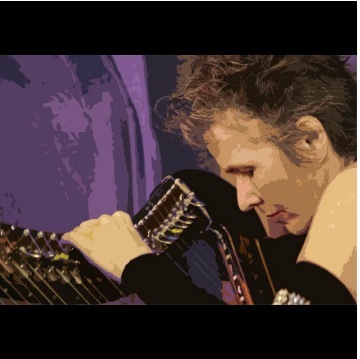 Deborah Henson-Conant strides on stage like a rock star – strapped into the sleek, chrome 32-string “HipHarp” that was invented for her to combine music, theater and movement in her one-woman shows. The Ponte Vedra Cultural Center is pleased to present this unique concert at the Ponte Vedra Concert Hall as a fundraiser for the outreach program, Music Therapy for Children with Special Needs. 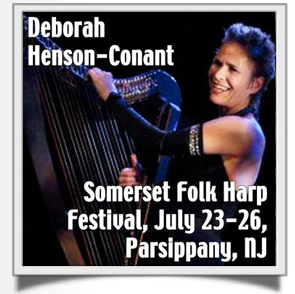 Deborah Henson-Conant is teaching blues workshops and headlining at Saturday night’s concert at the Southeastern Harp Weekend. This harp festival attracts participants from 36 states and five countries, one of the largest harp-centric shopping opportunities in the country, and world-class presenters, workshops and concerts. A special add-on to the festival is “Tuesday with Deborah” on Oct. 27th, a full day Blues workshop that can’t be missed! On Oct. 25th, she returns to one of the best listening rooms in the country, the Altamont Theatre. What’s Blab? First of all – if you’ve never been on Blab.im, it’s a new livestreaming social media platform that allows 4 people to interact on video – and an unlimited number to participate via streaming chat. People can come on-and-off the video feed, and they can truly converse. What is Searching Words for Music? It’s a game to FIND WORDS – the words that describe you! Artists have a tough time finding simple descriptive words to describe what they do – so this collaborative interactive game gives them the chance to hear the words that OTHERS would use to find them. On Jan. 9th, she returns to TCAN for her annual ‘Lose Your Blues’ show! This show will also be LIVESTREAMED at ConcertWindows.com! Lose your post-holiday blues! 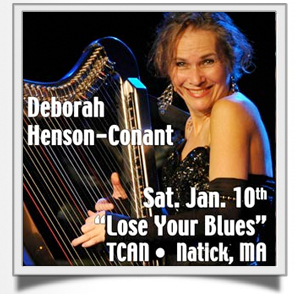 Grammy-nominated Deborah Henson-Conant brings her unique and riveting harp style back to TCAN. She’s a cross-genre, Blues-Flamenco-Celtic-Funk-Folk-Jazz dynamo, bantering with the audience and telling stories with ease. Reinventing the sounds of the harp, she solos and wails like a rock guitarist, turning music into theater and theater into something unforgettable. I built this one day course as the HARMONY FOUNDATION from a Harpist’s perspective. How harmony works on OUR instrument. I really want you to have this in your hands and your head – because it will make all the other courses I teach so much more fun and enriching for you. DHC was invited to perform as part of the Sensoria Festival: A Celebration of Literature & the Arts. Free and Open to the Public … but get there early to make sure you get a seat! It’s going to be a very, very cool show with Chamber Ensemble AND dancers from Central Piedmont Community College! 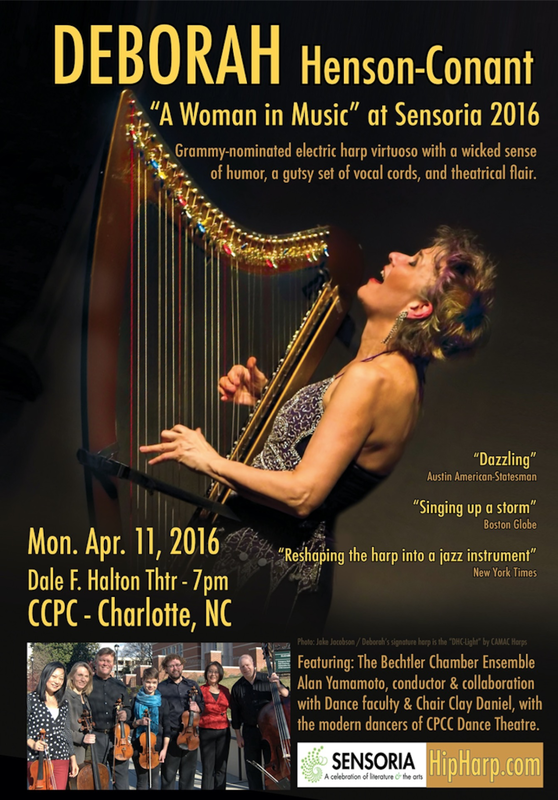 Deborah Henson-Conant will be at “Harpes au Max” International Harp Festival, May 13-15, 2016. Harpists from all around the world have been invited to the festival and will be playing extremely varied repertoires, ranging from classical to jazz, pop to rock – and even electronic music! Saturday morning, Deborah Henson-Conant will teach a workshop where she will give advice and share her experience in the field of improvisation with 20 amateur and student players. On Saturday night, in the Pop’Harps performance, the modernity of the harp is emphasized through three different repertoires taking us on a journey to Greece, Ireland and the United States. Breaking all the rules, the harps and voices of Elisa Vellia, Ranagri and Deborah Henson-Conant will shake up the public with their three reinterpretations of the legendary instrument. May 21st , 7:30 PM: DHC live on stage! It sold out FAST last time – and now she’s back!! Deborah Henson-Conant returns to the Pacific Harps Showroom for an intimate salon concert in the garden. A feel-good, outside-the-box, bring-the-folks-you-love kind of show for audiences of all genders and ages – folks who want to celebrate what it means to passionately follow your own creative path. May 22nd, 12 – 4PM: workshop with Deborah: Jazz, blues, improv and storytelling all in one workshop! REGISTRATION CLOSED: Get on the first-to-know list to find out when the class will be available again! The 2016 International Harp Festival will be held at the beautiful San Damiano Retreat Center with the mission to educate, inspire, and connect harpists from around the globe. 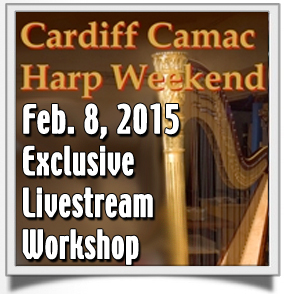 Free Playalong Webinar Trainings Just for Harp Players! What’s a Virtual Summer Camp? How is this different than an online course? In “Summer Harp Jam” there’s a huge focus on PLAYING, and a minimum of “training videos.” Instead of me telling you how to do something, I’ll be showing you and you’ll be playing it right back to me. Then you’ll get to take those ideas and play with them even more, because each week you’ll also get play-along files and cheat-sheets. And of course that live session is videotaped so you can watch it and play along over and over! The 13th annual Cape Cod Jazz Festival takes place at the Wequassett Resort and features some of the region’s best performers. It has become one of the most anticipated events of the summer season and is free and open to the public. Performances take place on the garden terrace overlooking Pleasant Bay. Cocktails and a light menu are available throughout the evening. DHC was invited once again to the Somerset Harp Festival! Expect her to be a dynamic member of this year’s guest-performers and faculty–encouraging and challenging to boldly go where no harper has gone before. In addition to her four workshops at Somerset, the festival is also collaborating with Deborah to present her Blues Immersion Experience special Sunday program add-on as part of our first full day on Sunday. The First Ever PLUCK Harp Cabaret is coming to the Underground at the Regent Theatre in Arlington, MA, Aug. 10 – 13. What is the PLUCK Harp Cabaret? Performing Live Underground Concert Kabaret. The series is part of my year-long “Harness Your Muse” mentorship program. It features the emerging artist who are developing their original shows and project through this yearlong program with me. There are 3 evening performance and one Saturday-morning Family performance. Attend LIVE at the Regent Underground Theater in Arlington, Massachusetts. Attend Virtually via ConcertWindow.com. 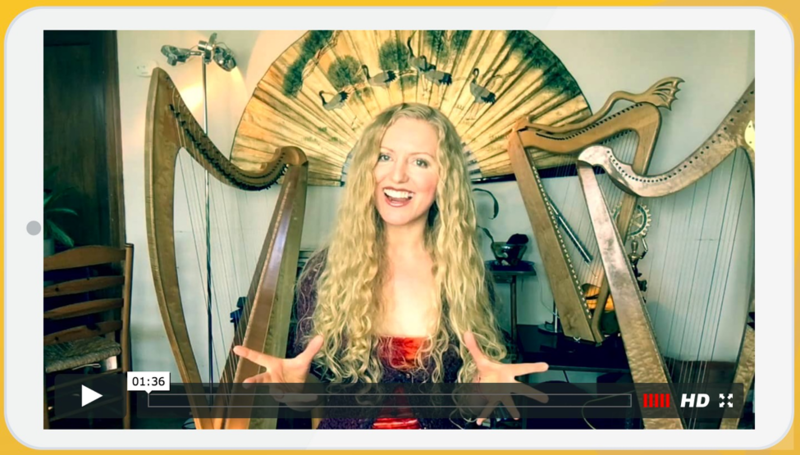 Harp Festivals are a big thing for harp players around the world and as more and more people play the harp – especially as adult beginners, it’s about time for a VIRTUAL Harp Festival! Spearheaded by my online-harp buddy Diana Rowan, it’s a free event focused specifically on developing more creativity in your harp playing. 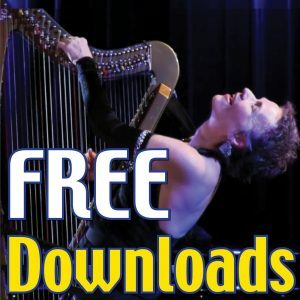 It runs over 7 days for absolutely FREE with 25+ harp luminaries from around the world.